Sometimes you just want to set down to a pretty lunch. We eat a lot of sandwiches around here for lunch, often PBJ. But with the fresh food at the farmers market meals start to get prettier this time of year. Here’s an example. Pasta swirled with a dab of fresh pesto, topped with the first little tomatoes sliced in half, green onion, lovely deep green celery – sprinkled with just a bit of parmesan cheese. 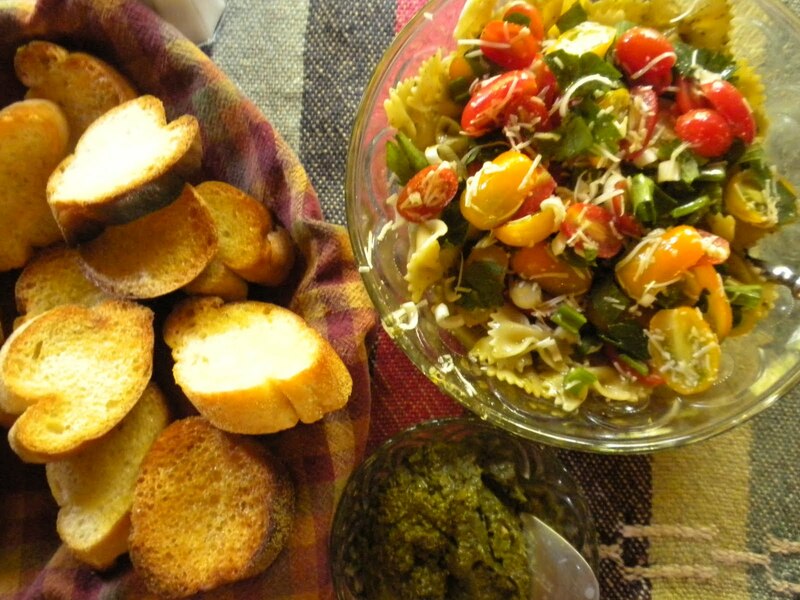 The rest of the pesto is served on the side with a sliced baguette that has been brushed with EVOO and baked lightly. Cold iced tea accompanied it naturally. We try to buy local as much as possible. We shop at our farmers market for produce and flowers, meat, bread…. The Cherry Street Farmers Market is great in that we can purchase local dairy items too, and a wide assortment of local grass fed meats. The bakers in the Tulsa area are good too, and our prepared food chefs are outstanding. In the coming weeks I’ll provide links to some of these folks and maybe some photos. What and when we aren’t buying from the farmers market we shop via an Oklahoma Food Coop. It’s amazing to see the array of food grown in Oklahoma. Getting to know the farmers takes dining to a different level than shopping at a big box store. So Readers – I’d love to hear what you’re finding at your local farmers market!